Gas grills are easy-to-use and efficient, allowing you to cook in a matter of minutes. They are able to make much more than just burgers and hotdogs; the best gas grills offer the versatility and performance that you need for cooking in your backyard. There are some gas grills fueled by liquid propane, while some others are fueled by natural gas. If your home doesn’t use natural gas, then you are certainly considering to get a liquid propane gas grill. 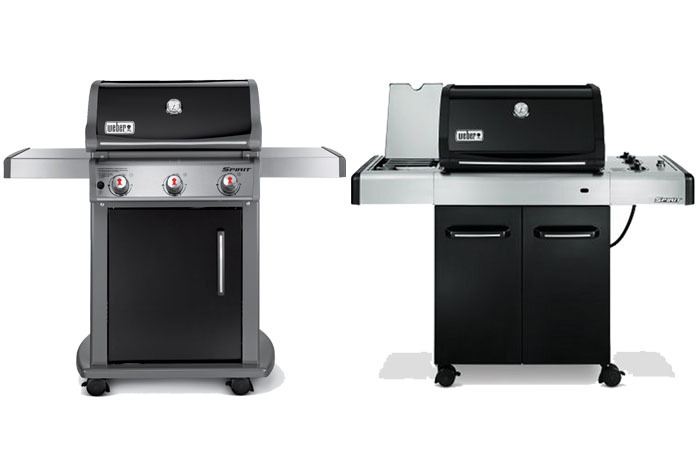 Weber Spirit E-310 and Weber Spirit E-320 are among the most popular choices on the market right now. They seem to be similar to a degree, yet Weber Spirit E-320 is priced slightly higher than Weber Spirit E-310. So, what are the differences between Weber Spirit E-310 and Weber Spirit E-320? Which is the one that you should get? Weber Spirit E-320, in many ways, is very similar to Weber Spirit E-310. It comes with identical specifications and features. There are three stainless steel burners, with a total of 424-square inch of cooking area and 112-square inch of warming rack. Indeed, Weber Spirit E-320 is a little bit bulkier than Weber Spirit E-310. However, this is due to Weber Spirit E-320 coming with a side burner, a feature that Weber Spirit E-310 lacks. The side burner has 12,000 BTU per hour input, which can be very handy for a multitude of cooking purposes. In addition, Weber Spirit E-320 also features a center mounted thermometer for informing you the heat level as you cook. Weber Spirit E-320 also features the Electronic Crossover ignition system, porcelain-enameled parts, and an enclosed cart. All in all, we advise you to choose Weber Spirit E-320 instead of Weber Spirit E-310. The side burner featured only in Weber Spirit E-320 is always a great thing to be had.